Sign up your child for the 9th annual Fun, Fitness, and Fundamental Multi - Skill Academy! Instructors for the camp will be current Oak Hill School K - 8 Physical Education Specialist Jenny DeLuca along with 2 X Olympian and Executive Director of KIDSPORTS, Bev Smith. What is the Fun, Fitness, and Multi - Skill Camp? The camp offers children the opportunity to develop important age appropriate movement and motor skill fundamentals. This camp is different than most team sport camps as it focuses on the development of each registrant’s fundamental movement and motor skills: Agility, Balance, Co-ordination, Speed, & Core Strength. The camp offers activities designed to build the registrant’s “athletic house,” which aids athletic performance and injury prevention. - Physical Literacy is the ability to move one's body confidently and in control. 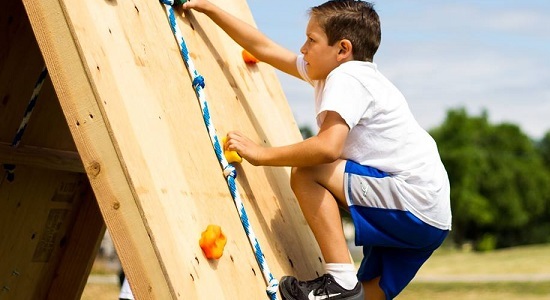 The Fun, Fitness, and Fundamentals Multi - Skill Camp will help your child develop the ABC's of movement and motor skill fundamentals: "Agility, Balance, and Coordination." - Again this year will be a Ninja – Like Obstacle Course and Competition. The obstacle course provides fun application of fundamental motor and movement skills that are covered in the multi –skill sessions. - Application of fundamental movement and motor skills will take place also through participation in modified games which also help registrants to develop age appropriate movement and motor fundamentals while having fun and getting fit. - Physical literacy development will not only help your child move their body confidently and in control, but as well, will aid in injury prevention, athletic performance, and provide a fundamental foundation for an active and healthy lifestyle! *There is some scholarship assistance available for free lunch/reduced lunch eligible families ($25 off of the price).